The first owner was Edmund Christy of the hat and towel family who, in 1872, commisssioned the architect John Dando Sedding to design The Knole which was then built by a local man, John Toogood. In fact, John Sedding and John Toogood received two commissions from Edmund Christy as they also designed and built St. Clements Church further along Knole Road that was largely funded by Christy. He provided some £30,000 for the land, the design, construction and completion of St.Clements in addition to building simultaneously his own house at The Knole. He even paid for the Vicar for whom he provided an income of £283 per annum. The project also included a Vicarage, St. Clements School with a schoolhouse for the Master and a pair of cottages for the Curates although the source of the funding of these items is uncertain. 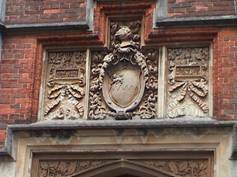 Furthermore, for his own house at The Knole, no expense was spared in the design or decoration. This room was the South Drawing Room which was completely re-modelled and enlarged during conversion to use as the Main Dining Room by the Freemasons in 1956. Today the room is oak panelled with the Honour Boards of the various Masonic groups which meet in the building. As you leave the Main Dining Room , the door facing you leads into the Small Dining Room which still retains much of its 1903 appearance. Note the original chimneypiece , the sideboard and the oak panelling. Turn left and left again as you leave the Small Dining Room and, after passing the staircase, you will arrive at the door leading into the Robing Room which is the original North Drawing Room. This room also retains its 1903 appearance although the drape curtains across the recess have long disappeared. Again the fireplace is original but note the candleabra with Masonic symbols. Now return to the staircase and on the first floor you will enter our Meeting Room and you will be facing the Chair of the Worshipful Master in the East, behind you sits the Senior Warden in the West, whilst to your right sits the Junior Warden in the South. Note the symbols of the two wardens on their pedestals – a level and a plumb line respectively. During a Meeting, the Secretary and the Treasurer sit opposite the Junior Warden at the desk with the Secretary’s symbol of two crossed pens. In the centre of the room is the stand for the set of Tracing Boards used in all Masonic ceremonies. This fine set of Masonic furniture dates from early 1900’s and was made by the firm of William Stagg whose works were in the Triangle, Bournemouth. Around the walls hang the Banners of many of the Lodges that at The Knole and some are more than 100 years old. When you entered the building, you may have seen a large carved stone plaque at our main entrance. This depicts the Legend of St.Hubert – a Saint in whom Edmund Christy had reason to have a particular interest. It is said that, in AD 682, Hubert the eldest son of the Duke of Aquitane and who lived in Northwest France, loved hunting and frequently forgot to go to Church in order to follow the chase. One Good Friday morning, a stag turned to him and a Crucifix appeared between its antlers. The stag spoke saying ‘Hubert, unless you turn to the Lord, and lead a holy life, you shall soon descend into Hell’. His wife died shortly after this incident and as in all good legends, Hubert renounced his worldly possessions and took Holy Orders. Around AD708, he became Bishop of Maastricht and later, Bishop of Liege in Belgium where he is honoured as the Founder of that city. His association with the hunt led to his designation by the Catholic Church as the Patron Saint of furriers and trappers. Now fur was a vital raw material for the family business as hatters and Edmund Christy commissioned this memorial for his new home to honour the Saint who looked after the source of his wealth! Edmund Christy left Bournemouth around 1880 and died in 1902 at Adcote in Shropshire aged 75. 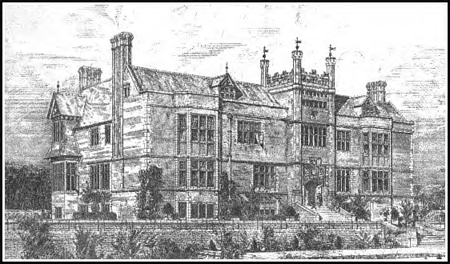 Following the departure of Edmund Christy, the house was leased to a number of distinguished people until it was sold to a Mrs. Richard Page Croft who bequeathed it to her son Sir Henry Page Croft, the first MP for Bournemouth from1910. 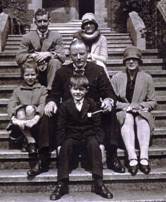 In the second World War, he served as Under-Secretary of State for War between 1940 and 1945 and was elevated to the Peerage in 1940 when he became 1st. Baron Croft of Bournemouth. He died in 1947 and is buried at Croft Castle in Shropshire. During the Second World war, The Knole was used as a Red Cross nursery for young children evacuated from Portsmouth and London. With the death of Lord Croft, The Knole was sold, much of the 51/2 acres of garden developed with housing whilst the house itself became The Knole Private Hotel until it was sold to the Freemasons of Bournemouth in 1957.